The Drowned Coast is the western region of Greenshade. 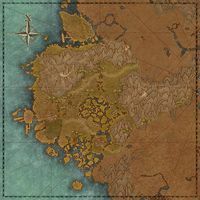 It includes the city of Woodhearth, as well as the Seaside Sanctuary to the north and Shademist Moors to the south, with the Drowned Coast Dolmen on an island to the south of that. It also extends in a wedge inland, reaching almost but not quite to the city of Marbruk. It is bordered on the north by Green's Marrow and the south by the Wilderking Court. The Veil Lifted 5 End the Veiled Heritance threat in Greenshade. This page was last modified on 7 July 2018, at 00:48.